Boy you sure did break it this time huh? You're making me feel bad for not having my fenders back on yet! It's funny how British cars make mechanics of us. 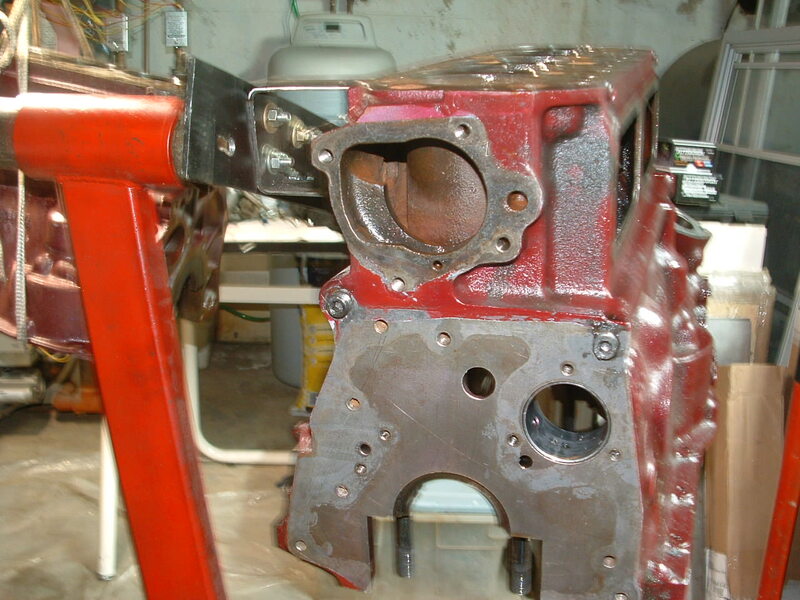 I had never completely rebuilt an engine until I started racing my TR3. Now I've done it many times, each time learning what it takes to keep it together longer. Fortunately, the most recent rebuilds have been for maintenance, rather than repairs. 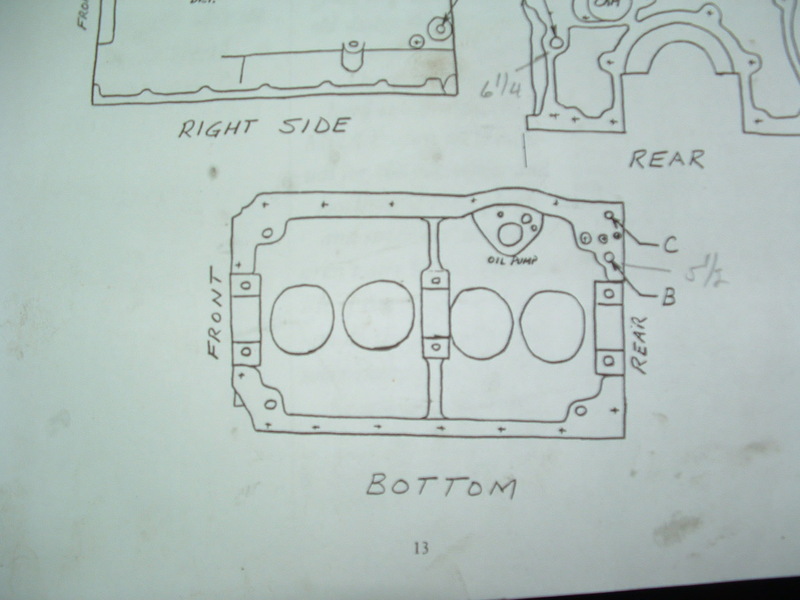 Jeff, have you thought about upgrading to the 5 main bearing MGB engine, if your sectioning body allows it? I've wished that Triumph had such an upgrade available. I continue to plug away at the race engine and the "back-up" block, performing some very tedious tasks that show no progress. Removal of the oil galleries on Hap's engine was a comparative breeze as he had installed threaded inserts that unscrewed fairly easily. On the spare block, I had the brass plugs and found removal quite difficult and time consuming since I don't have a slide hammer and since I didn't quite have the correct hardware on hand for removal. Since the location of the oil gallery plugs is somewhat of a mystery, I saved a "cheater" diagram when I stumbled upon it in an old NAMGAR magazine. This is for a 1500 engine, and the 1600 was slightly different. 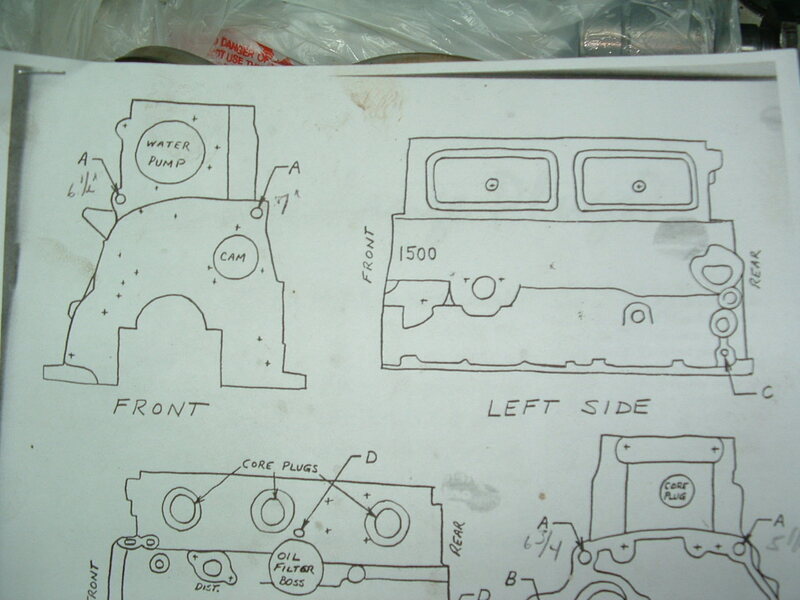 The main gallery plugs (A on diagrams) are .500" (1/2") diameter holes. The plugs labeled "B" are .438" holes, but hap seems to have drilled them out to half inch for the threaded plugs. I didn't mess with the plugs labeled "C" (oil relief vent) which have a .312" hole nor the plugs labeled "D". Here are pictures with Hap's threaded insert partially backed out to demonstrate oil gallery location. So far I haven't had the courage to tap the holes in the back-up block. I think I have the necessary tap(s), but I want to first make sure that I can find the threaded inserts. 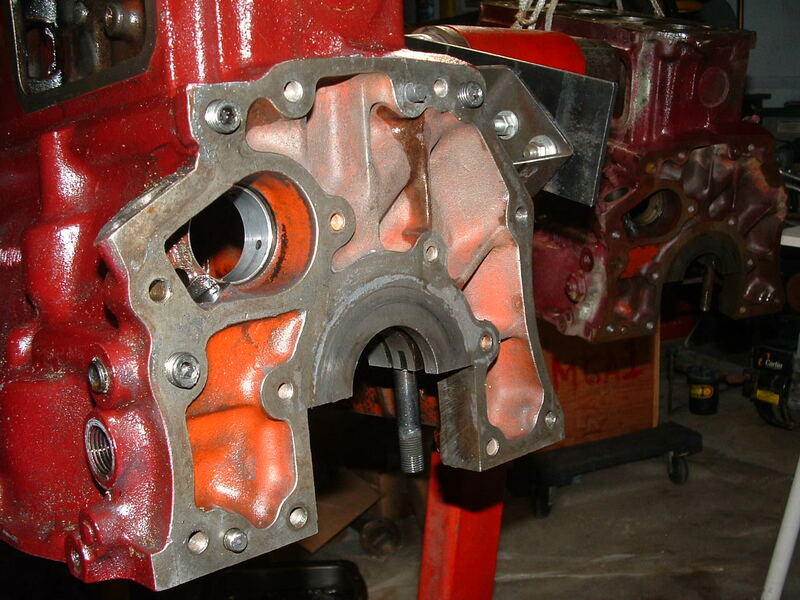 The back-up block is the source of the new crankshaft. Unfortunately, it was sadly stored by the fellow I bought it from, although he did cover the bores and the crank's rod journals with some sort of grease (hardened to a cake like consistency). 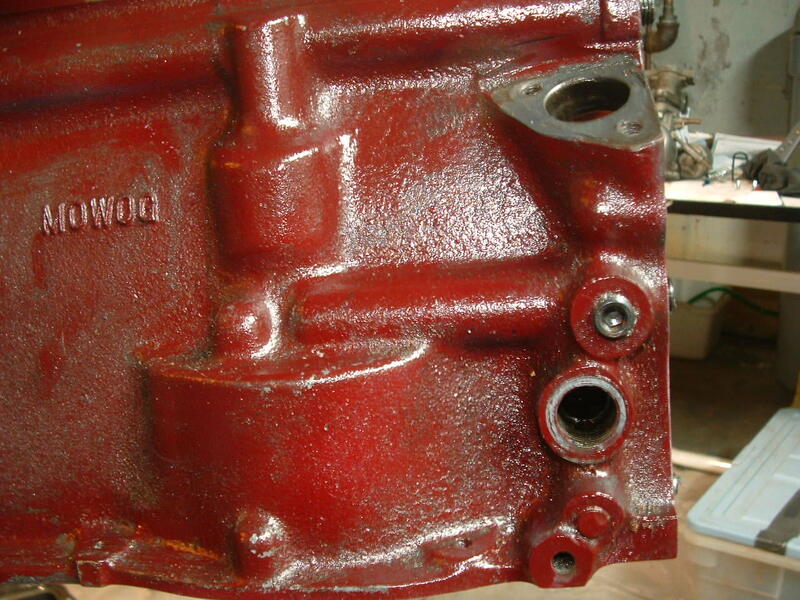 The crank's main journals, however, show some rust and the camshaft is too rusty to reuse. I've spent time just washing these parts so that I could examine their condition. The bores look OK, just a few spots of rust. For the time being, I left the core plugs in Hap's engine, as I'm not sure I will hot tank that one. I popped the core plugs out of the back-up block. Those original core blocks must have been 1/8 " steel and they were not so easy to remove. I left the camshaft bearings intact on both blocks. I'll discuss those with the machinist and leave it to him to remove if necessary. 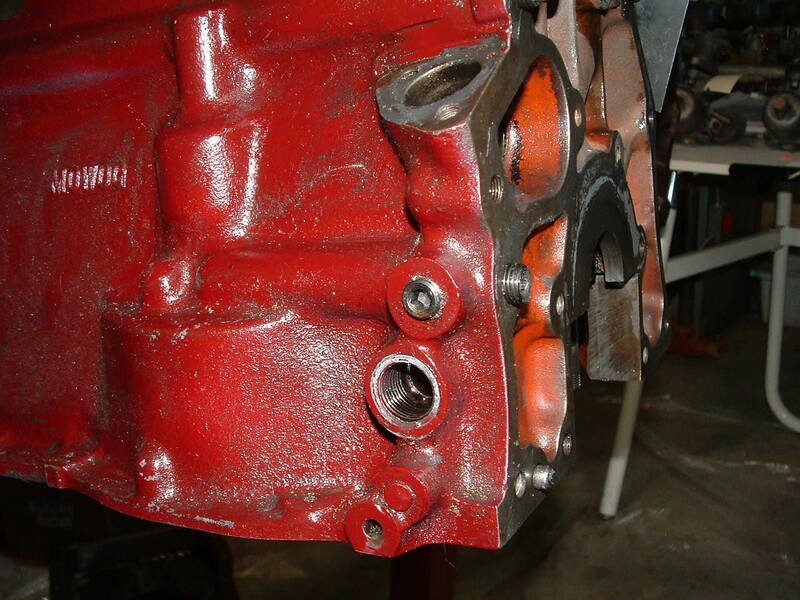 Otherwise, I have been chasing the various bolt and stud threads in the spare block, trying to avoid using the wrong tap and ruining the threads. I was going to try to remove the piston rings, but haven't quite gotten there. As previously noted, the #4 piston was damaged from hitting the head. The first ring land seems to have been crushed somewhat from the impact. Jeff - I try to understand what you're posting. But having never delved as deep as you have a lot of it makes me scratch my head. I do enjoy reading your description and then paying attention to the pictures to figure out what you are saying. Glad you are posting plenty of detail. Jeff, what you are calling "threaded inserts" look like they are set screws. Are they tapered or straight threaded? If straight threads are they sealing against something? I have used straight threaded screws in my TR3, which has a oil galley near the cam like in your MGA. I needed to used ample sealant on the threads to prevent an oil leak, since my screw doesn't seat on anything. Turned out that when I removed the stock poured in plug, the hole was threaded. Perhaps the MGA is similar? If they are tapered then perhaps Hap tapped then with a pipe thread? 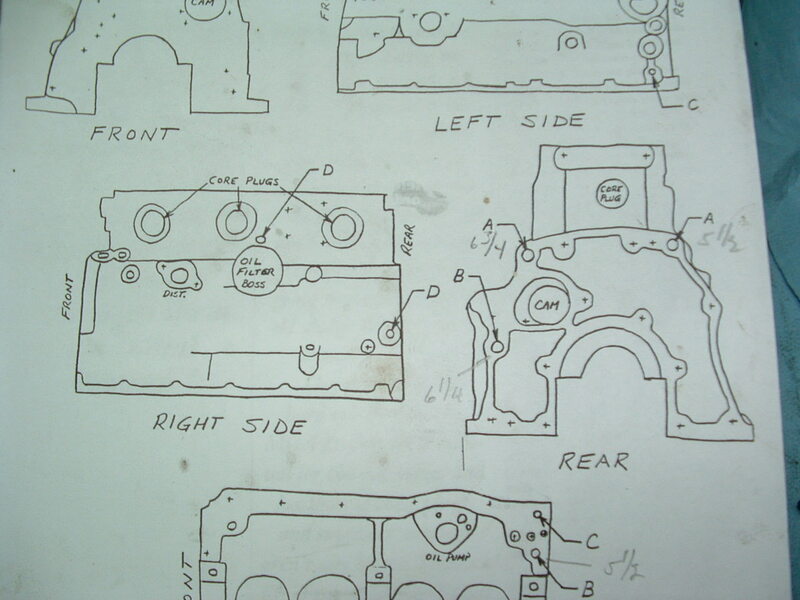 Antique engine designs are so much easier to understand! Fun to watch your maintenance/repair threads. These photos are giving me flashbacks to the Atomic 4 engine in my old sailboat! Flat head (L-head), though, so barely anything in the cylinder head other than the plugs. Jeff, have you seen this treasure trove of MGA's for sale? Ghost Main crankshaft order in process. I'm told that I'll be able to rev the engine to 10,000 rpm. But Order may be cancelled once the quote is finalized. Feeling depressed, so I drove the Volvo to work today. Only about 30 degrees, but no salt on the road yet and sunny. Despite temps, it started and bucked all the way down the hill to work. The ride is quite "unusual", but I'm old enough to remember the po'boy standard from '57. The car looked pretty cool when I scanned it at lunchtime. But then, forgot all about the car sitting in the lot, and it was dark when I went back out to head home. Headlights dim, and aimed too high to see much, but after a substantial warm up period, got up the hill in one piece. Still depressed. But I readily understand why resale value is less than an MGA rusted out, non-running restoration project. Alas, this may be the fall back race car for next season - Sedan Class or more likely Preservation Class. No excuse for depression. No matter what you race, you’re still doing more than most. If you raced the bus I think it will be a blast. You’ll be racing a new slower car and trying to do things with it like you did with the MG. The BRZ initially seemed like a bad choice as I was several seconds off of the S2000s time. Then it got better as I learned to drive it harder. If youre driving the bus to work though, please plan to leave before it gets dark.